The Mississippi River was the first stop for the 14th Dalai Lama on his trip to Memphis to receive the 2009 International Freedom Award from the National Civil Rights Museum. The river is Memphis. It's the river that made Memphis one of the largest port towns and brought together music styles upstream and down stream to birth the Blues and the Memphis sound. The river was also an escape route and spelled freedom for many slaves. 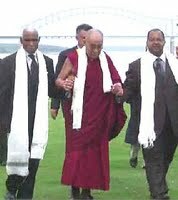 On hand to welcome His Holiness were Memphis Mayor Myron Lowery and Shelby County Mayor AC Wharton, Jr....He immediately put the two mayors and onlookers at ease with his smile. After receiving the key to the city and a proclamation making him an official citizen of Memphis for his devotion to civil rights, the Dalai Lama bowed and smiled. In broken English he expressed his belief in "human value" and "human affection," stating that affection and compassion can reach beyond issues of race, economic status, or any other dividers. "Compassions change our perception," he said. 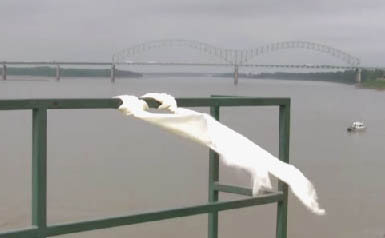 ... Before leaving the Mississippi, he bestowed a special blessing on the river with two Tibetan scarves. He smiled and looked at his fellow monks and said, "This is how we bless our rivers in Tibet. This is our river too."